1. Too faced, chocolate bar palette - I need a brown palette to go with (new) hair, ahah. 2 & 3. Body Scrub AND Body Lotion by The Bodyshop. 4 & 7. Foot care by Lush - season sandals is here, need to prep'. 5. a Konjac sponge - I've always wanted to try it! 6. 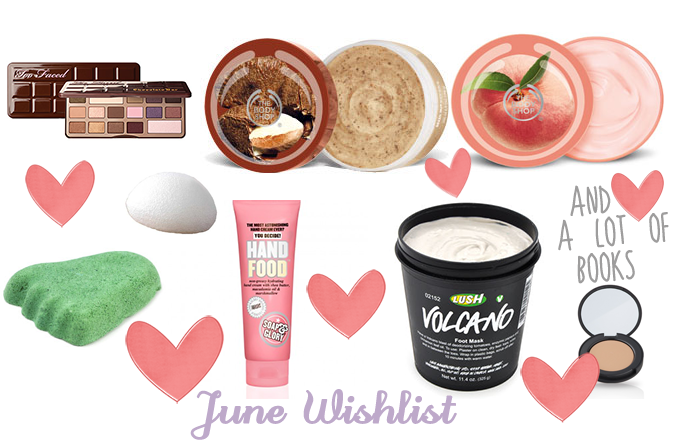 Soap & Glory, hand food - to help with my dry and sensitive hands. 8. Kiko, full coverage concealer - to finish up my under the eye concealing situation. 9. Well, we all need a little bit of distraction during those long days of summer, don't we? Plus, with my trip coming up, I will have to find something to get me busy through all the travelling I will do. So what do you think ? Do you have some of those products ? What do you want to buy?